Gov. John Kasich answers questions in his office at the state Capitol in Columbus. Ohio Gov. John Kasich looks back at his eight years in office in an exclusive interview with The Lima News. Read about his thoughts on his legacy, his future and his party in The Lima News on Sunday, Nov. 11. COLUMBUS — Ohio’s governor knows Americans are frustrated with the fighting within government. He has a pretty simple answer: Vote. The two-term governor, who can’t run for re-election, is aware the Republican Party has changed over the years. He unsuccessfully ran for president in 2016, and he admits to having some philosophical and style disagreements with President Donald Trump. Kasich spent much of a 50-minute conversation fighting the notion that party politics are all that important. “When you’re plucking someone off a tree during a flood, do you ever ask them, ‘Who’d you vote for?’” Kasich said. Still, he continues to support GOP candidate Mike DeWine. “I’ve known Mike for 30 years. I’m going to do an ad for him,” Kasich said. Kasich said he genuinely didn’t know if he’d run for president in 2020, either as a Republican or as an independent. That didn’t mean he didn’t have strong opinions about Trump, though. He questioned the president’s trade and immigration policies. He particularly questioned Trump’s claim of being a “nationalist” instead of a global leader. He urged more leaders to “to put ourselves in other people’s shoes,” using the surge of Guatemalan refugees coming up through Mexico now as an example. He disagreed with Trump’s push to keep them from entering the United States if they’re truly running from danger. In recent years, Kasich’s been a maverick figure, sometimes fighting against members in his own party on issues such as expanding Medicaid and calling for reforms on gun laws. 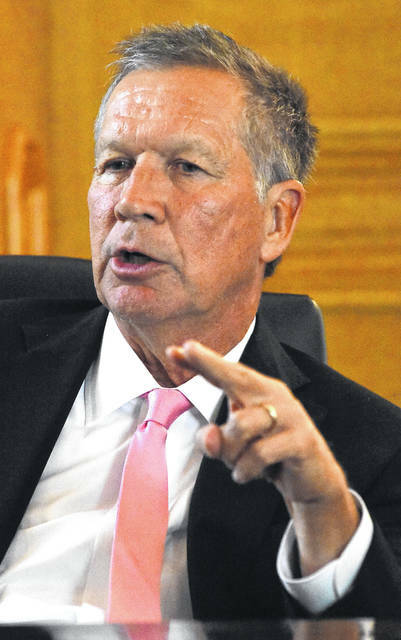 Kasich said other politicians are finally starting to catch up to his beliefs, though. “A lot of my positions, particularly Medicaid expansion. for example, now politicians are running as fast as they can to my position,” he said. https://www.limaohio.com/wp-content/uploads/sites/54/2018/10/web1_John-Kasich_01co.jpgGov. John Kasich answers questions in his office at the state Capitol in Columbus.